How do I use my Tax Report? Your Tax Report is broken up into 7 tabs that contain all of the data that you have tagged as business/personal or entered manually in the app. If you haven’t tagged or manually entered the transaction or mileage, it will not appear in the report. 1. Tax Summary - The first tab is the Tax Summary. This tab contains the summary level details for income, expenses (categorized by the IRS’ Schedule C categories), and mileage. To view the detailed list of these items, you’ll need to look at the other tabs. 2. 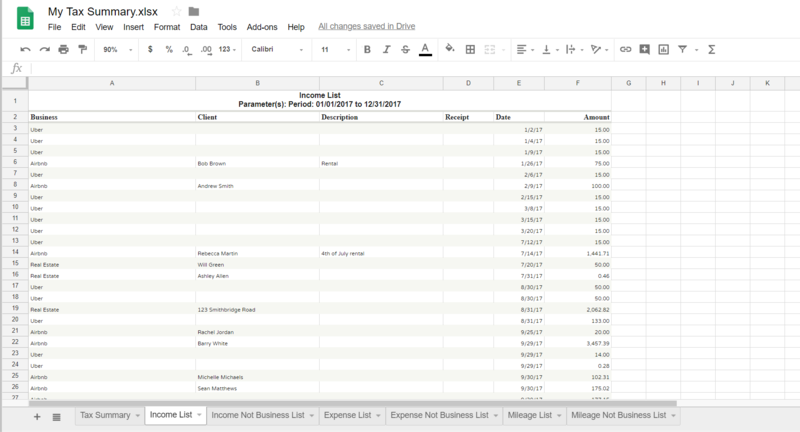 Income List - This tab lists any income that you’ve tagged as business. It includes all details like business, client, description, receipt link, date, and amount. 3. Income Not Business List - This tab lists any income that you’ve tagged as personal. 4. Expense List - This tab lists any expenses that you tagged as business. It includes all details like tax category, business, client, merchant, description, receipt, date, and amount. 5. 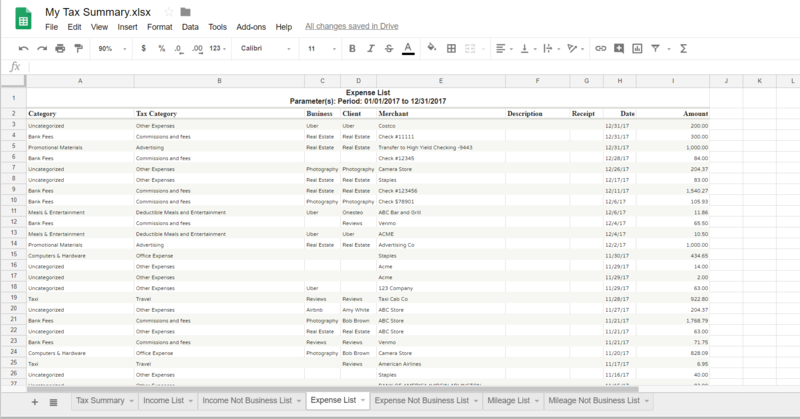 Expense Not Business List - This tab lists any expenses that you’ve tagged as personal. 6. Mileage List - This tab lists any mileage that you’ve tagged as business. It includes all details like date, business, client, description, car, start/end location, duration, start/end time, distance, and deduction. At the bottom, it includes the total mileage and total deduction. 7. Mileage Not Business List - This tab lists any mileage that you’ve tagged as personal.